While Revit has adequate tools for individual plants, planting areas (for perennials and the like) are not as easily done. There are many system families that calculate areas: filled regions, floors, rooms, and areas. Though you could use filled regions, it is never advisable to use an annotation for a physical (model) element. Instead, I recommend areas. Areas are funny little families. Like rooms, they overlay over everything and only appear in plan view. Since they are designed for floor plans, they are not ideal for planting plans, but they work well enough. Just like most things in Revit, this process requires a bit of investment initially, but the payoffs are there immediately when you start tagging. As a system family, their shared parameters must be loaded directly though Project Parameters (under Manage tab). I’ve shown below which shared parameters I load in for Areas; I don’t load Scientific Name (explained below). Areas only show up in special plan views: Area Plans (I use Rentable). So after making an area plan you then need to draw area boundaries. This is one of my least favorite parts of this workflow because it gets a bit redundant drawing boundaries multiple times (but you can lock these boundaries to your existing edges). I use the Name parameter as a replacement for Scientific Name. 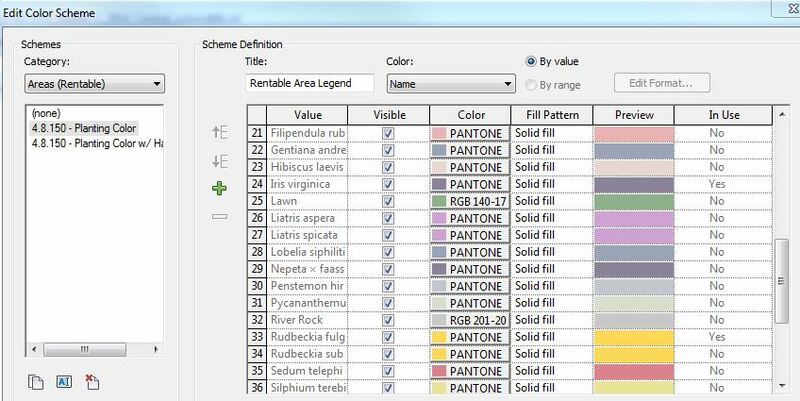 Revit remembers all of these that you’ve tied into Color Schemes. So you can easily grab them as you place Areas. Now, there are a few downsides to this workflow. Unless you lock your area boundaries, they will need to be updated when your hardscape/softscape edges shift. Also, Areas are not intended to be used as plant types, so their parameters are all instances and do not lock across type. This can be addressed by using Area Styles (Part 4), or it can be monitored manually and updated in your final schedule (where you are not itemizing every instance). How do you make the planting areas total up in the schedule? I want to add up the total area for each plant. I did skip over a few scheduling basics… If you want totals to show up in your schedule field, go to Formatting, select the field and check ‘Calculate totals’ (under Field formatting). This is necessary in any schedule that has multiple instances and isn’t itemizing instances. Haha, yes, it is unfortunately not idiot-proof. Since type properties do not exist in areas, there is no way I know of to make them type parameters. This is one of the downfalls (as I mention above). I offer 2 semi-solutions: Copy your areas; they will keep their parameters. And double-check your final schedule (if your parameters get off, you will be able to see it in your final schedule). Hey, I think I’ve cracked it – aligning the parameters I mean. You make Schedule Keys, which CAN make Area ‘Types’. – Edit the Fields of the Key Schedule, add more Parameters (not Shared Parameters unfortunately). Add these new ‘parameters’ to your Planting Area Schedules, and they will all stay nicely aligned to the Keys (Species Name). The downside of key schedules is that you can’t tag from the parameters you create in a key schedule. You still therefore need a Type Mark parameter of some kind, such as a plant code. The codes then need aligning with the species name in your planting schedule. You can do this on ‘types’ though, rather than instances, so it’s not too bad. 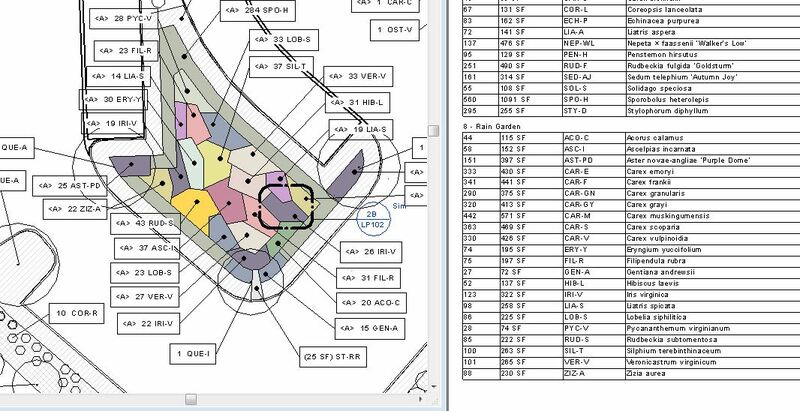 Thank you posting this- it is incredibly helpful as you know there are very few LA related Revit posts. It seems like you are doing a lot of CD work using Revit which I find to be an exciting prospect. I wonder if you wouldn’t mind posting this planting tutorial file for more information. If not I understand. Thanks! Hi Dan, thanks for posting a comment! Yes, we use Revit to do full CDs for all landscape documentation, including the occasional grading and storm system on smaller projects. How much do you use Revit at CRJA? I don’t mind posting a .rvt file, though I’ll have to make one that’s worth putting up. Is 2014 ok? We are using it more and more everyday, mostly for conceptual modeling along with architect supplied buildings – however there is a push to move those conceptual revit files into CD production to get more value out of all the modeling we typically do for projects. Yes a 2014 file would work fine. Funny, I read your post about Eaglepoint and I agreeed that it was a little lackluster, especially if compared next to Vectorworks for example. Hi we just started with Revit so I’m just in the begining of this. So I have a basic question but I don’t get the calculation to work. How can I fill in spacing? Hi Jenny. Any parameter added to a system family (such as Areas) must be added as a Project Parameter. This is how I add all of my custom parameters – Plant Common Name, Size, Condition, Key, and Spacing. Hi thanks for Quick replay! ( I’m from Sweden so I’ll try to explain this as good as I can in English) Ok, I tried to follow your instructions bur for me as a beginner it was a bit hard because I don’t know all of the steps between. But the thing I want to do is a planting plan. I figured out how to do the area and divied it to pieces, put Area in it and now I want to calculate it. I did a new schedual and added parameters but maybe that wasn’t the proper way? Maybe that can help you figure out what you are missing.